Michael Chaffee, philosophy, The Maze, Writer. Poet, Speaker | Challenging the perceptions for our realities! In applying our intuitiveness to the pursuits for gaining a better understanding from life’s journey, there are path networks, hedges and trail endings, that are designed to mystify and confound. They in fact, are meant to provide testimonials for our spiritual ingenuity, through which one has to find their own way by employing their individual mindfulness! The physical description of such places having these attributes, are known as mazes and the imaginary locations that we harbor in the folds of our minds are what we frame in as our individuality. Although both of these descriptions infer a correspondence to that of two dimension physical characteristics, it is from our evolving mind images that we produce our three dimensional perspective. These are our views and they will individually form and ultimately represent how we differ! It is at the boundary lines of our contrived definitions that our mind justifies the formulations for our various ascribed disciplines, and from these we attribute our actions to the confusion in conclusions for what may appear as our sound reasoning! 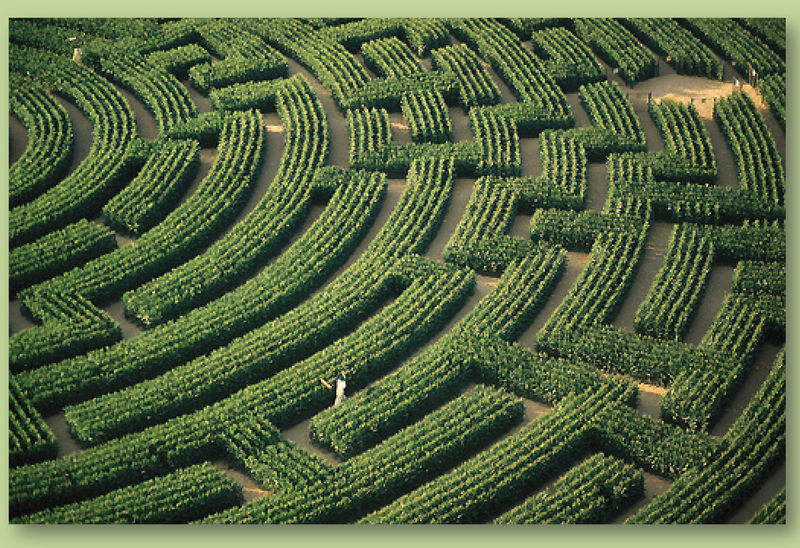 The resemblance of a maze in reference to the corridors of one’s mind suggests that in the confines of the imaginative mind, that our souls are addled with becoming confronted with moral perplexity. Our moral cognizance struggles with choice, as our reasoning struggles with our internal language of agreement for the terms and conditions of our virtues. It is in the limitations of our dimensional definitions for what appears as real or unreal that our reasoning formulates our perceived realities and thus begins to take comfort in those familiar surroundings. In the shadow of an imaginary “forest castle” we’d apply subjugation and make assumptions for what we see in the hues and tones of an imaginary color, whether real or unreal! 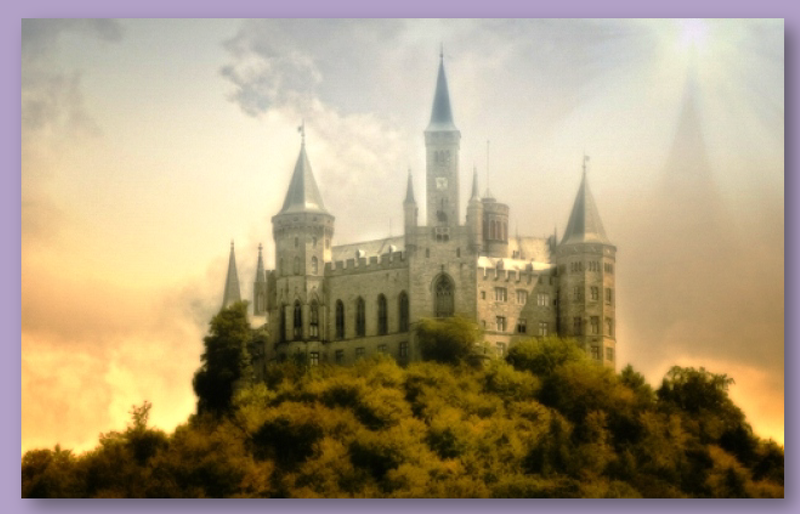 As we build the “der Grundstein” that support our castle walls of individualized meanings we anchor our beliefs to the Ashlar stone support footings, which allows our fortresses to be built taller upon the hilltop of our homestead in beliefs. The decision of selection in narrowed path and the conquests in overcoming the slung arrows of formidable foes, offers us up trait definition for explicit attributes and these may provide us with our justifications for building taller and stronger castles. Behind the moats and retracting draw bridges and in the security of the Arrow Loops, one may be assured that his or her fortified positioning can presumably provide the defensible armor that could repel even the most cunning adversaries. Yet while seeking an assured confirmation that such positions are defensible, small doubts linger in restless slumber within the many possibilities that lay hidden behind the imaginative hedgerow’s maze of meanings. It is in the pursuits and attempts at developing an understanding, that one may begin to appreciate that seeking answers in the maze of life, is in fact an endless journey! There are no final destinations, and just as in the illusionary castle that sets upon an imaginary hill, our perceptions originate within a labyrinth of corridors of unrealized potential. This is where our decisions are charted and the course beyond the obscurities of the hedge are contemplated as having any potential at all…. What lays beyond the hedgerow…hasn’t taken form yet in today’s reality. What lays beyond isn’t part of the here and now but, lingers and is awaiting the discovery of our personalized tomorrows! It is from the core of our imaginations, not the substance of our intellect that we pursue the meaning of life, and it will be in those imaginative pursuits, that we may capture a glimpse of who we represent in the instructions being given to our individual souls! From the collaborations with our spiritual ingenuity, we seek out meaningful interpretations for which path will lead us to a continuance or which decision will result in a trail’s dead end? These are the challenges that will form the ranking of our character, for in the resulting decisions of free choices, a representation of our reasoning becomes our statement. Our promotions in advancing from a spiritual enlistee to a non-commissioned officer in God’s army of love, will be accredited according to the accounting of our loving intentions. As we come upon each fork in the road, a decision in choice defines us and from such choices a definition for our individual souls are given the chance to become known, as a loving soul or otherwise. What will be said in that moment of wordless expression? In the solace of one’s decisiveness, what coexist in the placement of feet upon pathway’s trail-head? The choice in voice is ours and ours alone…for the hedges are merely a manifestation of self induced order, the meaning of which only offers suggestive possibilities for how we imagine our trek, not an absolute destination or confinement to narrower path! If one takes a moment alone to seek Peace in the midst of chaos and listens to the unspoken silence that emanates from Peace, then one can discover the path that will lead them through life’s maze. “The feeling of Peace will pervade our lives as soon as we are attracted to the Real more than the unreal”. “Peace conquers its enemies, not with force, but by their undoing”. “Peace does not desire to change the world, for in Peace, all is well and ever was and ever will be”. “When whole nations bend to serve the wishes of one gentle soul, it is because they have heard the peaceful voice of an angel”.